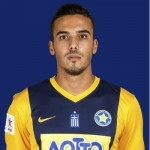 Dimitris Kourbelis is a footballer who currently plays for Asteras Tripolis. Having come through the youth ranks of Asteras, he has gone on to be a key member of the first team for Tripoli. He was a member of the National Team U-21, having also played for the U-19. He made his debut in UEFA Euro 2012 qualifying against Germany in February 2012.